It is estimated that 65% of adults are affected by various forms of stress and the number is rising. Almost 70% of adults suffer from sleep problems of one form or another. These problems, which often remain undiagnosed and untreated, can have such harmful effects on biochemical parameters and on short, medium and long-term health that stress is often termed the invisible killer'. ¤ L-theanine induces relaxation without causing drowsiness (like kava-kava), an effect which can be measured by increased alpha waves in the brain. In fact, studies show that it even improves the brain's ability to concentrate, learn and memorise. In Japan, chewing gum, ice cream and soft drinks fortified with l-theanine are included on the menu for students during exam periods. ¤ Unlike caffeine, l-theanine raises brain levels of GABA (gamma-amino butyric acid), an inhibitory neurotransmitter which induces relaxation and promotes a feeling of well-being. ¤ L-theanine also increases brain levels of both dopamine, the pleasure and reward' neurotransmitter, and of serotonin, the main inhibitory neurotransmitter, both of which are severely compromised in situations of stress and overwork. ¤ Studies show that l-theanine offers additional health benefits: it protects the brain from glutamate-induced neuro-toxicity, a major cause of neurodegenerative disease. It significantly reduces mental, physical and social symptoms of PMS. It regulates blood pressure. It helps temper the unwelcome effects of caffeine. ¤ According to a recent study conducted at the National Institute of Mental Health in Japan, 200 mg of l-theanine taken before bed improves sleep quality to such an extent that participants all awoke feeling “more rested” after a “more effective” sleep, without necessarily sleeping for longer. Subjects also reported waking up more easily in the morning, feeling alert and refreshed instead of groggy. Taiyo Kagaku is the Japanese company that discovered l-theanine, isolated it in order to make it bio-available, protected it by more than 40 patents and made it available to the public in a pharmaceutical grade product under the brand name Suntheanine®. All the studies confirming the efficacy of theanine have been carried out using Suntheanine® and it is the only product to contain only the L form of theanine (the D form found in cheaper imitations offers no biochemical benefit). Obtained by enzymatic extraction from green tea, Suntheanine® is the product we are offering, in the form and at the exact dose used in these scientific studies. Alongside Suntheanine®, other bioactive molecules may also be of interest for promoting general well-being. One such substance is the amino acid L-phenylalanine, the effects of which can help improve mood. The patented product PEAK ATP™ may help restore energy levels, while in terms of promoting balance in the body, the formulation Natural Thyro Formula provides significant support for the thyroid gland. 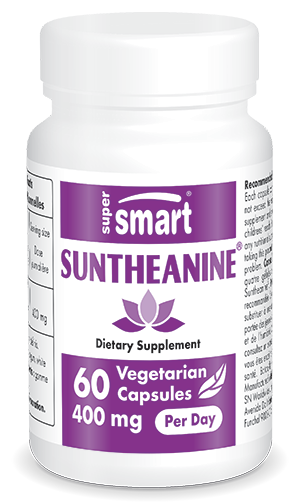 Each vegetarian capsule contains 100 mg Suntheanine®.